Abstract: Maxtor have been producing hard drives steadily for the last 20 years, and the new 80GB D740-6L line of drives is an example of their continuing efforts to produce faster storage media. Maxtor have been producing hard drives steadily for the last 20 years, and the new 80GB D740-6L line of drives is an example of their continuing efforts to produce faster storage media. On a side note, we have had pretty good luck Maxtor HDD's, and the few times they died, a simple RMA solved the problem. Given those experiences, we always suggest you look at the RMA policies of a manufacturer before you decide to buy one brand of hard drive over another - especially if you are purchasing OEM drives at the local computer store. After all, it's better to protect your investment in the technology, than to be stuck with a drive that can only be returned to the store for servicing. Stepping back a bit, when Maxtor acquired Quantum last April, things really didn't look very good for the hard drive industry in general. Later in the year, Fujitsu even stopped making desktop hard drives, so the industry has been seeing a decline in numbers. To survive as a viable company, Maxtor decided to diversify their product line up. To this end, they now carry a whole array of Firewire products. Getting back to the ATA/133 hard drive on hand, the new D740X line uses the controversial Ultra/133 standard which Maxtor helped develop. I say controversial, because Intel has been pushing for development of Serial ATA technology and not the Ultra/133 standard. To Intel, ATA/133 is a waste of time and resources. However since HighPoint controllers are available now, and Serial ATA devices are not, the ATA/133 standard has been winning friends in the motherboard markets as evidenced by a slew of ATA/133 compliant motherboards released recently. The D740X-6L has a rotational speed of 7200 RPM, an advertised access time of 8.5 ms and supports Fast ATA (Ultra/133). 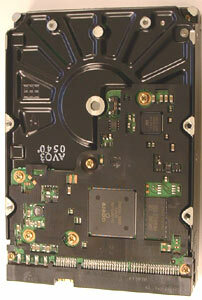 The hard drive was tested in our Athlon XP2000+ system. Unfortunately, we didn't have an Ultra/133 controller card to test with so we only used the VIA VT8233 southbridge as the IDE controller. It natively supports Ultra/100 only. 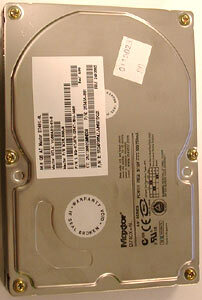 The hard drive was defragged with Norton Speed Disk after the OS was installed. The 80GB Maxtor is rated a little over 10% faster then the reference 30GB 7200 RPM Ultra/100 drive. This is most likely due to a higher areal density, which results in quicker access time. As we can see, the D740X-6L is one fast drive! It would have been nice to see how fast this thing would burst, but HDTach was unable to display that data because it was off the scale. Historically, the VIA Southbridge hasn't been as fast or reliable as 3rd party IDE controller cards, and the 7.8% CPU utilization is very high all things considered. Still, that's not really the fault of the Maxtor hard drive. WinBench 99 confirms what HDTach and Sandra say, the Maxtor D740X-6L is very fast with an access time of under 10ms. That's is something to point out since, hard drives usually never come close to their advertised specs. Maxtor has done very well again with their new D740X line, offering extremely fast IDE drives for a very competitive price. Considering this 80GB ATAT/133 drive retails for about $180USD, you really can't go wrong in terms of value. The best peace of mind is Maxtor's excellent track record for service. If you need high capacity and high performance, look no further then Maxtor's D740X.